This ornate butterfly is an anti-maccassar. It is one of many in a set of Lepidoptera-themed craft work. Clicking on the image will take you to the rest. It is not my work. I can knit. Poorly. 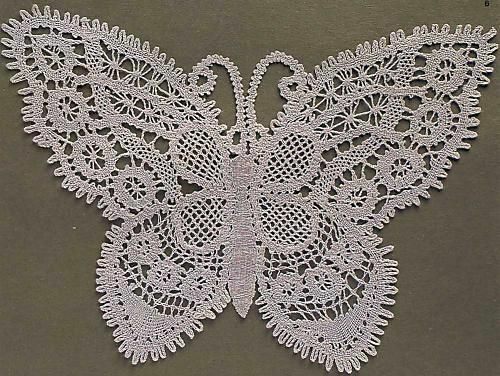 Although the image description says "crochet", I think this resembles embroidery or needlework, as it is so finely detailed. It is beautiful, especially those curled antennae. Anti-maccassars are those little covers on the arms rests and backs of chairs. They aren't doilies. I tried to find a less arcane sounding word, to no avail. Alternative word suggestions are welcomed as comments!